Water Crisis in Detroit: Who’s Being Shut Off and Who’s Not? Indebtedness isn’t always treated equally in our society. Some people get dunned incessantly by debt collectors while others seem to be able to run up thousands or even millions in debt but are given the latitude to extend their indebtedness until their income and assets catch up. Differences in treatment—or indifference to some of the human costs—seem to be the case with Detroit water bills. As we reported last week, the indebtedness of hundreds of thousands of Detroiters involves delinquencies on their water bill payments. But some customers’ water bill delinquencies may be getting different treatment from city bill collectors. Individual property owners may owe a few months or several months on their average $75-a-month water bills, but a few have some bigger numbers. According to information attributed to the Michigan Citizen and Detroit television station WDIV, the Palmer Park Golf Club owes the Detroit Water and Sewerage Department $200,000, Joe Louis Arena (where the Detroit Red Wings hockey team plays) $80,000, and Ford Field (home of the Detroit Lions) $55,000. We haven’t seen reports on the city shutting the water on the Lions or Red Wings yet. But Detroit Water has gone after delinquent residential customers like Nicole Hill, a single mother with three children whose water has been turned off. She is one of thousands who are more than $150 dollars behind on their water payments that Detroit Water has targeted for shutoffs as an inducement to pay their bills. Hill says she moved into her apartment five years ago, but shortly thereafter started receiving monthly bills from the Water Department for about $200. Bills that high might indicate a water leak someplace, and Hill called the department but couldn’t get explanations or revisions. She was then told that she somehow owed $5,754. She began paying $2,800 a year to try to catch up, but the City demanded another $1,700, money she doesn’t have, before it would even consider putting her on a payment plan. With no water service in her apartment, she has now has sent her children to live with friends, fearful that Child Protective Services would take them away if they were discovered living in a place without water. If you have lived through a water shutoff for any prolonged period of time during the hottest months of the year, you know the health and sanitation challenges facing Nicole and her children. This is a human rights crisis, as the United Nations and several advocacy organizations such as Food & Water Watch have made clear, as well as a local health crisis. Late last week, Representative John Conyers tried to ratchet up public awareness of the dimensions of the crisis. He wrote to President Barack Obama asking him to release some of the $200 million available to Michigan in the “Hardest Hit Fund” to deal with some of the cutoffs and petitioned HHS Secretary Sylvia Mathews Burwell to designate the situation in Detroit a public health emergency, enabling the provision of federal health relief. In the pages of nonprofit journals like ours, much attention has been devoted to the unprecedented efforts of regional and national foundations to gather resources to prevent the collection of the Detroit Institute of Arts from being auctioned off to help pay for the city’s pension obligations. 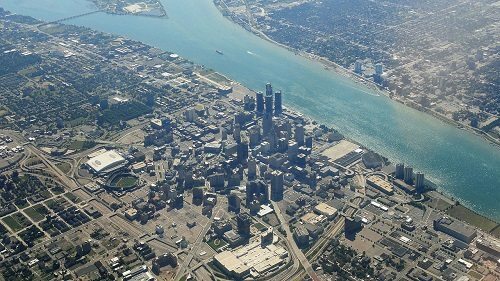 In addition, foundations have taken the lead in generating plans for the revitalization of Detroit’s troubled neighborhoods, with their surfeit of abandoned buildings and vacant lots. But the water shutoffs as implemented by the Detroit Water and Sewerage Department end up adversely affecting Detroit’s poorest citizens, who have to live through what seems like the kind of public health crisis that would be expected in a Third World country. Facing indebtedness of $5 billion, the Water Department has financial needs that would strip most foundations of what they could possibly provide. But the same applies to the Hardest Hit fund, which has only $200 million left earmarked for Michigan. No funding entity appears prepared and capable of paying off Detroit Water’s debt. But nonprofits, foundations, and others should be joining together to reverse this untenable human rights crisis.